Annotations are identified by blue markers that look like this: , and are a way for developers to convey important, non-visible information about the design to other project members. As a Reviewer, you cannot create Annotations, but you should explore them in order to better understand the design’s creator’s intentions. Annotation markers are numbered, and you will typically want to explore them in order. 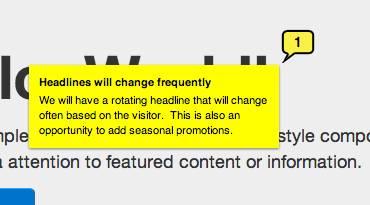 Likewise, selecting an annotation in the sidebar will highlight it on the design. 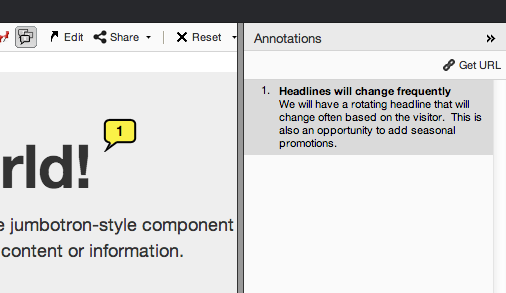 You can use the sidebar this way to step from one annotation to the next. You can de-select the annotation by clicking elsewhere on the design. Normally, ProtoShare shows all annotation markers on the design. There are times, however, where you may want to hide the markers. You can do so using the button in the toolbar above the viewing area. Note: If an annotation is selected in the sidebar, its marker will always be shown on the design.